Let the acrimony and recriminations begin; let us point fingers and begin the most important task in these sorrowful times - assigning blame. We need to figure out who is responsible for this horrible deed, because obviously there are accomplices who need to be rooted out and punished. Every time there is a national tragedy, we engage in this blame game We seek out or create villains in order to be able to dump the nightmare at their feet. Tragedy becomes a political football, perfect for scoring points against all opponents. "This is proof of the war against Judeo-Christianity," said Congressman Gohmert. "It is the sign of a broken mental health system," according to a HuffPo columnist. "It happened because we have too much gun control," cries the NRA. "No, it is because we don't have enough," claims Senator Lautenberg. "It is because we have lost the Christian rudder that steers the country," as countless letter writers to the Denver Post feel. We search frantically, desperately to find some reason to explain this mass murder, and all such events. There has to be a reason, some hook to explain the evil that men do. There have to be collaborators and facilitators, who create an environment to allow them to do it in. There have to be some motivational factors that spurred the actions. Sometimes people are evil just because they are evil. To quote Barbara Hambly, "The question is always the answer if you need one badly enough." Sometimes there are just evil people in the world who do evil things. This is a very hard concept to stomach. It implies that things can be senseless, unpreventable and unpredictable. It means that we can't always keep bad things from happening, and it means that when they do happen, sometimes we will never understand why. These thoughts throw our well ordered world into chaos, which is what Christopher Nolan's rendering of the Joker represents. He is the agent of Chaos. And by adopting that persona, James Holmes also became the agent of chaos. I am not saying that he didn't have his reasons for his violent attack on innocent movie patrons, maybe he is insane, maybe he was on drugs, maybe he was acting out some sort of sick fantasy, maybe he was just trying to get revenge for some imagined slight. However, just like we never learn why the fictional Joker rampaged through Gotham City, we may never learn why the man who claimed to be the Joker went on a real rampage in an Aurora movie theatre. Maybe there is no rational explanation for why James Holmes viciously shot 71 people in cold blood. And this reality makes it that much more terrifying. A few years ago, I watched an episode of the BBC series "Torchwood," which normally revolved around finding and stopping alien attacks on humans, sort of a dark and twisted "X-Files" meets "Men in Black." In the episode "Countrycide," the team investigates a series of disappearances, murders and cannibalistic acts that are so gruesome and evil that they assume that only an alien could be responsible; they were just too inhuman. In the end though, the monster was a human family, and the instigator was the father. He was the most vicious monster in any episode of the entire series. When he was asked why he did it, his chilling response was, "It made me happy." That was it, no further explanation or examination, no deeper message. He did it simply because it gave him pleasure. His simple statement still gives me chills, because it is at once both absolutely inhuman and utterly human. The cold, calculating evil revealed resides in the human race, and we see it over and over again, and yet we cannot bear to look at it, because we see ourselves reflected in the face of evil. So we have to explain it away, because otherwise it becomes a mirror of our own souls. We all have the capacity for unlimited grace and absolute evil, but this is not something we can admit to ourselves and so we have to come up with other rationalizations. This process leads us into completely unhelpful dialogs that distract us from the evil men do. In order to show how these are distractions, I'll quickly poke holes in the top arguments that I laid down earlier. To do that, I'll run though some counter arguments. "This is proof of the war against Judeo-Christianity." I'm not actually going to even dignify this one, simply because it is a straw man. As such, it is not worthy of comment. "It is the sign of a broken mental health system." How do we know he was insane? One of his former professors said he was the "top of the top." Yes, he was antisocial and a loner, but unless social disconnection becomes a mental illness in it's own right, this does not prove he was unhinged. The incredible exactness of his plan and execution of it does not indicate a disordered mind. We do need better mental health care in this country, but this massacre is not a foundation for why we need to make the system better. "It happened because we have too much gun control." No, not at all. My father was an army major, and a strong advocate of gun control. His reasoning, which I have not heard enough from the politicians, was very simple. Soldiers and police officers go through intense training to know how to use their weapon in a high pressure situation, which is very different than hunting or being on the gun range. Even with all of their training, you still get a lot of friendly fire accidents and collateral damage. 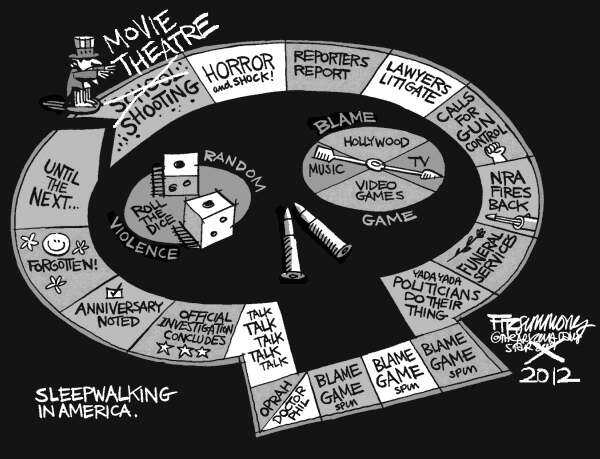 Imagine several armed people shooting in a fear situation in a darkened theatre. There would be a lot more than twelve casualties. Adding more guns into the mix would have resulted in more, not fewer, deaths. "It is because we don't have enough gun control." Also, a true concept in some ways, but utterly inapplicable in this situation for two reasons. First, James Holmes never did anything in his life that would put him on the radar as someone who shouldn't be able to buy a gun: he didn't have a criminal record; he had never been treated for mental health issues; and he had never indicated that he was a threat to anyone. Second, even with the best gun control in the world, a truly determined person will be able to get his hands on some sort of weapon. If he hadn't been able to get a semi-automatic, he probably would have used more bombs, and made them deadly. He obviously had the skills to do so. The means might have differed, but the end would have been the same. "It is because we have lost the Christian rudder that steers the country." Christianity is not the only moral compass, all religious systems try to impart a rigid system of ethics and morality. Also all religions have their murderous nutcases, just look at David Koresh or Osama Bin Laden. Both of them were extremely fundamentalist and devout in their religious beliefs, and yet they caused more deaths that James Holmes. Besides, this country was never founded in Christianity. Remember, the man who wrote the Declaration of Independence and the Bill of Rights was a Deist, not a Christian. So all of these frames that we try to construct to explain the crime are probably not accurate, they are only a means to advance a political agenda, and as such not worthy of further discussion. We can justifiably look at a culture of violence or the motivations of the killer, but even these don't necessarily explain anything. Until or unless we get a statement from the criminal himself, we will never know his motivation. Also remember, if he is setting himself as the Joker, anything that comes out of his mouth cannot be assumed to be true or valid. Similarly, any explanation we give it is our own projections on his psyche, which also has no authenticity. Therefore, we are left with the spectre at the feast, he did it because he wanted to, and because he was evil, amoral and twisted. It is not a demonic evil, it is a human evil. It is an evil that we can all understand, although most of us will never dance with it. And no matter what we do, that evil will still exist in some of us, you will never stop it. And because of that, we have to face an even more unpleasant truth than the fact that people are capable of real evil, and we will never know why. We have to accept, no matter what we do, bad things will happen, people will be killed and villains will walk the earth. All we can hope for is that most of the times the monsters will be stopped before people die. All we can if they are not is band together and support each other. Pointing fingers and laying blame does not heal us. Bad things will happen, no matter where the blame lies. There is nothing we can do about it except stop blaming and start supporting those who are hurting. Our accusations don't make their recovery any easier.